8 Things to Check out in Minot this Summer - Word on the street with Visit Minot!Word on the street with Visit Minot! The weather is heating up and the Roosevelt Park Pool is the perfect place to cool down. Starting Saturday June 4, you can grab your towel and sunscreen and enjoy a dip in the pool. Admission is $4 a person and that give you access to the pool, kiddy pool and of course the water slide! The pool is open Monday – Thursday 12 Noon – 5 PM and from 6:30-8:30 PM. Friday, Saturday and Sunday the pool can be enjoyed from 1:00 – 8:00 PM. Join Visit Minot and the Scandinavian Heritage Association (SHA) on Wednesday, June 8th as we kick off summer with a dual event at the Scandinavian Heritage Park! Festivities will begin at 6:00 PM with FREE hotdogs, chips and water or lemonade (while supplies last). There will be bounce houses, traditional parade of flags from all of the Nordic countries and their national anthems, and live music by Tin Star from 6-8:00 PM.The annual bonfire will begin at 9:00 PM.Visit Minot’s first Movie in the Park, Norm of the North (©Lions Gate Entertainment, Inc.) at 10:00 PM after dusk. Remember your chair, blanket and bug spray! Oak Park recently had book frames installed and completed along the walking path. The community partners that have worked on this project are inviting people to take a hike with literacy. With the new installation of the ‘story boards’, you can walk the Oak Park trail, and read a book, page by page! This is a fantastic opportunity in the summer months to not only get children up and moving but also engaged with reading. The books will be updated periodically throughout the summer. The Story Stroll will launch and be active starting June 9, after their grand opening ribbon cutting. The Minot Street Art Movement has given historic Downtown Minot a facelift! From diamonds and strips to Tetris blocks each piece of wall art has been different, but one thing remains the same, bright colors, and lots of it. Downtown Minot has been under construction for what seems like forever, but a group of volunteers have started adding color by painting alleyways. Most recently, the Minot Street Art movement got art from local grade school students and created an outdoor children’s art gallery which can be seen on the sides of the Central Ave Parking Ramp. Reds, and Whites, and Mascato, OH MY! The Downtown Minot Business & Professional Association are set to host the Annual Summer Wine Walk on June 10. With more than 20 businesses offering samples, partakers will get to stop at each participating location and fill in their ‘Wine Passport’. Each stop will include a light hors d’oeuvres and of course, a wine sampling. 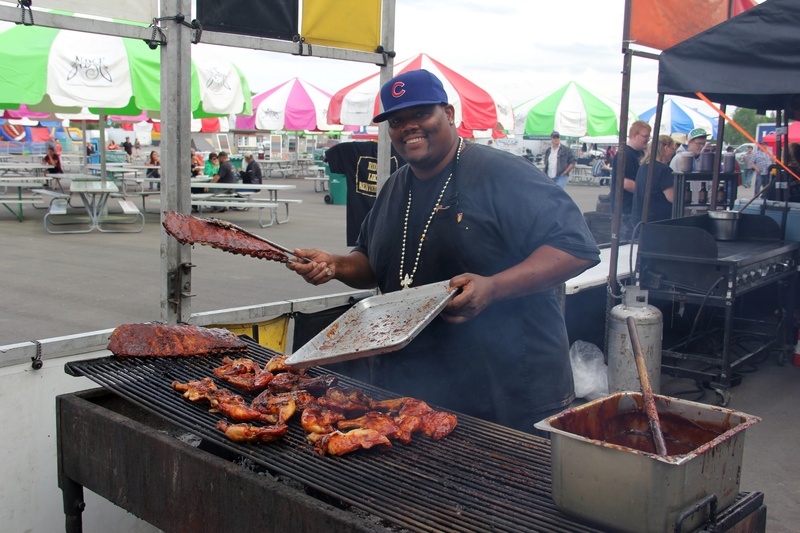 Magic City Ribfest is any carnivore dream! From June 16 – 19, there will be lots of BBQ-ing, including your favorite dishes such as pulled pork, chicken, and of course ribs! James Otto, a country artist will take the stage on Friday night and Saturdays Classic Rock Concert is Firehouse! As a note: this year’s Magic City Ribfest will be held at the Minot Auditorium parking lot. Yes, you read that correctly… bacon, and beer! On July 14, leave the kiddos home and enjoy a refreshing beer and mouth-watering bacon at the annual Bacon & Brew at the Roosevelt Park Zoo. The admission ticket will include beer and bacon tasting featuring various craft beers and bacon delicacies from area restaurants and eateries. Tickets are $50 per person, and must be 21 to attend. Can you believe it? The North Dakota State Fair is just around the corner! With top musical artists, bull riding and over 49,000 competitive exhibits the fair is fun for the whole family. Don’t forget about the Carnival rides and games and your favorite Fair Foods. Did someone say fried cheese curds? There will also be multiple FREE stage shoes with fantastic performances throughout each of the nine day event. The North Dakota State Fair runs from July 22-30. For all events happening in the Magic City check out Visit Minot’s calendar.